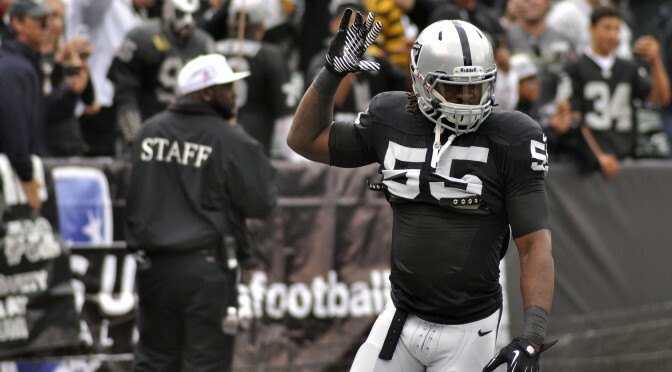 Linebacker Sio Moore is known to Raider Nation as the fiery, energetic, dancing, hype-man linebacker on game day. His positive energy can be felt from his teammates next to him on the field all the way up to the upper levels of the stadium. That excitement always seems unbreakable, impenetrable and constant. Moore has dealt with adversity throughout his life, but last season, when he was injured to the point that required surgery, his energy, positivity and focus were tested. Despite only playing in 11 games in 2014, Moore nearly doubled his tackle total from his rookie year. There were glimpses of the type of player he could be. Although the injury took away his ability to play a full season, the third-year linebacker was too resilient to let a setback take away his passion for the game. Recovering from his injuries kept Moore out of a majority of the offseason work on the field, but he was finally able to get some good reps during the Mandatory Mini-Camp. “It was even more of a learning experience going out there because now I see where I am and where I need to get to by the time camp comes around,” said Moore. From the day he was drafted by the Raiders in 2013, Moore has learned many valuable lessons about football and life from his experiences. Moore now has veteran linebacker Curtis Lofton in the middle. Moore has always understood the importance of aligning himself with the players with experience, knowledge and success in order to better himself. A new benefit for Moore this year is the wealth of knowledge emanating from the coaching staff. The third-year linebacker has Head Coach Jack Del Rio (11-year NFL linebacker), Defensive Coordinator Ken Norton, Jr. (13-year NFL linebacker), and linebackers coach Sal Sunseri (University of Pittsburgh linebacker) to gain information. Moore believes that because all three coaches [Del Rio, Norton, Jr., and Sunseri] are former linebackers, there’s a deeper understanding, higher expectations, and a different level of focus and determination.